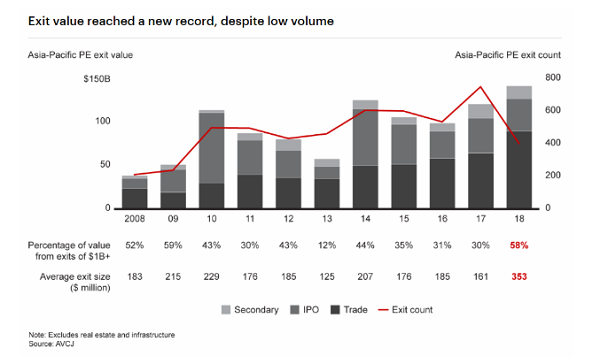 The value of Asia-Pacific private equity exits reached a record after jumping 39% to $142b in 2018 compared to the past five-year average, according to Bain & Company’s 2019 Asia-Pacific Private Equity report. The surge in exit values, which were led by China, India and South Korea, reportedly outpaced the previous all-time high of $125b in 2014. According to the report, exits worth $1b or more accounted for 58% of total exit value, and the average exit value doubled to $353m from the 2013–2017 average. “By contrast, exit values dipped sharply in Japan, Southeast Asia and Australia and New Zealand compared with the past five-year average,” the report’s authors noted. The report highlighted that trade deals were the largest exit channel, with Walmart’s $16b purchase of India’s Flipkart from SoftBank Vision Fund and others helping to push trade deals to 63% of total deal value from 53% in 2017. Other large trade sales included the sale of China’s Ele.me for $5.2b. Meanwhile, the value of total initial public offering (IPO) exits fell slightly from 2017 and the past five-year average, given greater stock market volatility. On the other hand, whilst the value of secondary exits dipped 9% from 2017, it was almost 40% higher than the previous five-year average. Additionally, the amount of unrealised value of PE investments surged to $646b in 2018. Bain & Company noted that if multiples begin to contract, PE funds may risk building up an exit overhang. “Exit data reveals a market increasingly split into two starkly different realities: Large, experienced PE-owned companies racked up the vast majority of successful exits and dominated total exit value, whilst smaller companies had increasing difficulty finding buyers,” the authors commented, adding that the number of exits of companies sold for less than $100 million plunged to 205 in 2018, down 58% from 493 in 2017. By contrast, the number of exits larger than $500m rose 26% to 59. 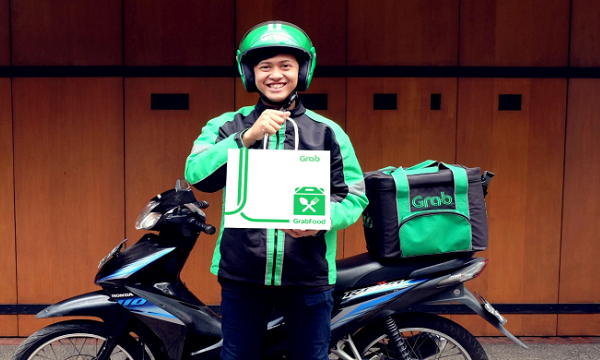 As the risk of global recession rises, a tougher market for exits is doubly challenging. Two-thirds of Asia-Pacific general partners (GPs) surveyed said they intended to sell assets significantly or somewhat faster.